I have to confess that since starting back to work, my reading pretty much revolves around teaching. However, Southern Living did a feature in the December issue on Fannie Flagg. Fannie is probably my all time fave! I had to run out and grab this book. Have you read it? Still a few days until we go back to school. I love the title of the book....it's time for a a quick book shopping! I like Fanny, too. I love the cover, and the title is a great one. Please give us a review when you are finished reading it. I haven't read that one yet. I'll have to get it at the library. I've enjoyed everything I've read by Miss Fannie Flagg. (Am I crazy, or did she used to be on Match Game???) I know what you mean about not having much reading time during the school year. Magazines and blogs are all I have time for it seems. I haven't read this one yet, but loved the Southern Living article. I have enjoyed her other books, so I am sure this one will be great too. Would love to hear how you like it! Have you read The Help? Great read...Currently reading Experiencing God which I have enjoyed..
Hope you get it finished! So glad you have had time to do some reading..I love Fannie Flagg and will be vacationing in Florida and will definitely have to get this for me and my Mom to read since I will have some quiet time. She loves Fannie Flagg too. Enjoy the rest of your time off. Miss your frequent posts!! 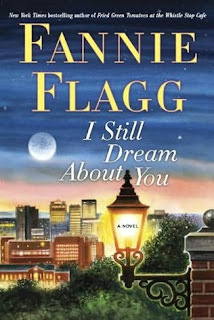 Love Fannie Flagg too. I will be getting this one soon. We are in the middle of a move so not much reading time yet. So glad to see your post today. I know teaching has been your focus, but miss your posts. I got this free on Audible.com! I can't wait to listen to it! I did a post on her quite a few months ago...she is my favorite too! I've been working on sewing projects this fall, so I have not read a book. I have never heard of this book!~ It looks so cute! Right up my alley!Enjoy reading! Perfect time of year for it isn't it! Thank you SO much for your comment!!!!!!!!! WOW! Made my day that's for sure!